Hi! I’m Tracy Snyder, At Home with Sweet T’s blogger, creator…pretty much everything. I live in Central Indiana with my family. My favorite thing to do is be creative. I like DIY, crafts, simple cooking…anything that lets me get my creative juices really going. I love to repurpose. I like creating something good, pretty or useful from something that wasn’t needed or wanted any longer. I guess that makes me pretty frugal, but with a family of 6 you kind of have to be frugal. When I’m not creating or working on the blog I am spending time with my family. I rarely miss a game or meet, I like the opportunity to cheer on my kids and watch them shine. Luckily my parents, my sister with her family, and my husband’s family all live close so we are able to spend time with them too. And the last important thing to know about me is that I LOVE sweet tea, and pretty much anything sweet and sugary but sweet tea is my favorite. My husband, Rex, is exceptionally talented carpenter who is supportive of this website and is patient in teaching me the correct way to use tools. I have 4 kiddos spread out in ages from teens to toddlers. My oldest Jackson is 17 and plays football for his high school, hence the Friday Night Light series here on the blog in the fall. He is already studying and training to be a firefighter. Jackson is a good big brother. My oldest daughter, Lissy, is 13 and in middle school. She is my swimmer girl, she swims year round for USA swimming and on the middle school team. I love her heart, she pretty much likes everyone and has her own style and doesn’t care what others think. Then we have Nolan, he’s 4 and full of energy. He is a carpenter in the making, can tell you tool names and how to use them and often refers his dad to fix things for other people. Our Sadie girl, 2, was a surprise, but the best and perfect kind of surpise. She was born tiny and is still on the small side. Don’t let her size fool you she is mighty and enjoys playing and keeping up with Nolan. 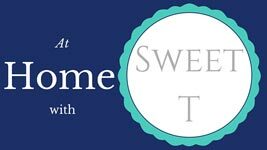 What does At Home with Sweet T mean? Well, first “at home” is because that is where my heart is, at home with my family. We spend a lot of time at home and I spend a lot of time turning our house into a home full of love. “Sweet T” has two meanings. As I said before sweet tea is my favorite so why not name the blog after my favorite beverage. The second meaning is why tea was shortened to just a “T.” My name is Tracy, starts with a “t” like tea so I put it all together, and I think I’m pretty sweet too. Ha! So there you have it, I’m At Home drinking Sweet tea, being me, Tracy. Get it?